The following table attempts to make sense of which Sony Alpha dSLR, SLT and Interchangeable lens Mirrorless cameras offer support for remote shutter releases. 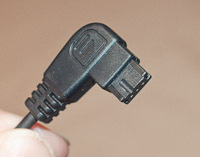 To use Sony, Minolta or third-party wired shutter releases, your camera needs a connection port that corresponds to this connector. Sony offers several different remote shutter releases. 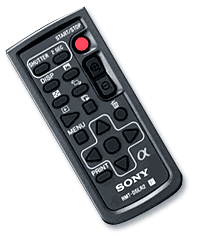 The Sony RM-S1AM and RM-L1AM Remote Commander are wired remote shutter releases. They are functionally identical, the RM-S1AM has a short 50cm cable, while the RM-L1AM features a much longer 5m cable. These remotes are based on the Minolta RC-1000S and RC-1000L which date back to 1985. Both the Sony and Minolta wired remotes have the same camera connection terminal, so I have lumped them together in the following chart. Any Sony camera that supports a wired remote can be triggered by any of the four. The same cameras can be triggered with any of the DIY Shutter Remote designs I posted here in the past. There are also various third party remote shutter releases that should work with these camera models. Sony has also developed two sophisticated infrared remotes, which operate much the same way as your television remote. The use of these remotes varies with different camera bodies. Some cameras can use either remote while only certain features work on some cameras. Sadly, there are some cameras that do not offer any remote release capability. This chart should help you determine which remotes work with your camera. Sony has also released a Smart Remote Control Play Memories Mobile app for iOS and Android. This app allows certain cameras to be controlled over a Wi-Fi network. The drawback is the system requires Wi-Fi, but the advantage is that the supported cameras can transfer the image from the Liveview LCD screen to your iPhone, iPad , iPod Touch or Android device. This gives you a remote viewer as well as a remote trigger. Currently, this App only supports the NEX-6 and NEX 5R. Hopefully, this technology will spread to additional Sony camera bodies in the future. If anyone has any experience with the Play Memories Mobile app, please share your feedback. I compiled this list from various Sony resources, internet sites and my own personal experience. Hopefully it is accurate, but I take no responsibility for errors. If you see an error or have additional information, please leave a comment below. Find your camera model in the left column. Compatible remote shutter releases are marked with an X in the adjoining columns. Search for a specific camera to limit the table to that particular camera. Sort the columns by clicking on the diamonds in the header of each column. If this page was helpful to you, please share it on Google Plus.